Find out how talking openly about later life with family and friends has helped other people feel confident when making important lifestyle decisions. "It was difficult to leave our home, but that doesn't bother me now - all the worries and costs about keeping the house are gone." 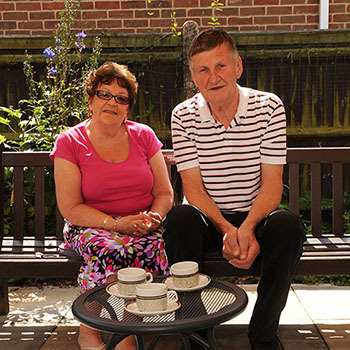 Talking through their wishes with loved ones helped Jean and Steve Maycock fulfil their retirement plan and gain security living in an Anchor retirement village for the coming years. When Jean, 75, realised she no longer felt safe home alone while husband Steve, 64, worked night shifts, they decided to move. They found Anchor's Nene Court sheltered housing in Cambridgeshire met both their needs, providing the independence of having their own flat with help on hand should Jean need it. Three years later there's no regrets and Jean loves to be involved in helping staff decorate the communal areas. Jean says the key to achieving their plan was talking it through with daughter Mandy. Discussing everything with Mandy ensured she could appreciate the benefits of the move and support her mothers wishes. "I love my apartment and the security of not being on my own. There is always someone to talk to and so much to do. It's a comfort to know that there is the facility of care on site if I need it." Joan Emms, 83, first found Denham Garden Village in Uxbridge when her daughter Lynda moved in. Lynda, 60, decided to opt for something different when moving back from the north of England. Talking to one another about what they wanted from their futures helped Joan and Lynda realise that moving somewhere together was the right decision for them. Mother and daughter now each have their own apartments in the retirement village, and busy lives. Joan has been at Denham for six years and shares a retirement apartment with 92 year old Fred. 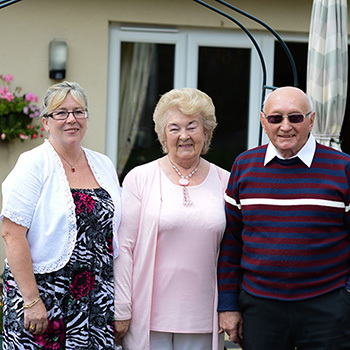 Joan and Fred are old friends who reconnected at Anchor's Denham Garden Village and the couple are now engaged with wedding plans afoot. Denham offered exactly what both women were looking for - proximity to family, a modern apartment, and plenty going on. Future care plan needs weren't part of their original decision but since moving in, both mother and daughter feel assured that onsite support is on hand if it's needed.